The sixth meeting of the 2016-2017 year took place at the National Weather Service Jackson office. Chapter member and NWS Jackson SOO Chad Entremont was the speaker. The sixth meeting of the 2016-2017 AMS/NWA chapter was called to order at 7:07pm by NWA President Eric Carpenter. The meeting was held at the National Weather Service office in Flowood. Recording Secretary Joanne Culin recorded those in attendance, with 13 people present. An attendance sheet was passed around that indicated when dues were last collected for each person, or if their membership had lapsed. Minutes from the January meeting were summarized by Recording Secretary Joanne Culin. The business session began with a treasury report, given by Treasurer David Cox. At the end of the January meeting, the treasury stood at $278.29. 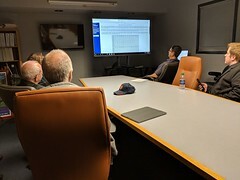 Funds were given to support the NWS Jackson Emergency Manager workshop in February, which allowed the treasury to be at $228.29 at the beginning of this meeting. Two members renewed dues, which brings the dues to $268.29. As of this meeting, we have a total of 18 members: 15 regular members and 3 student members. As a reminder, memberships are now valid for an entire year, rather than just through the remainder of the current chapter year. Will Day and Eric Carpenter are still in the process of planning a meeting for April at MDOT. Joanne Culin reported the chapter has been recognized as a Weather Ready Nation Ambassador and Daniel Lamb is the contact person for the chapter for this partnership. Our speaker for the meeting was NWS Jackson Science and Operations Officer Chad Entremont. Chad spoke about the new GOES-16 (GOES-R) satellite. 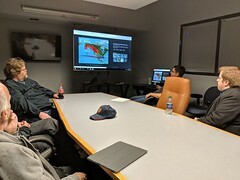 This new satellite requires the NWS staff to endure 8 hours of training. GOES-R is the first in a series and will be followed by GOES-S, -T, and -U. GOES-S is expected to launch in November 2017. The ABI(Advanced Baseline Imager) is the main hardware system on GOES-16. The Global Lightning Mapper is a new function for this satellite. GOES 16 will provide more detail with improved spatial resolution(up to 4x better). It will also provide more frequent updates, with CONUS scans every 5 minutes, mesoscale sectors every minute, and full disc every 15 minutes. This is 3 to 5 times better than previous GOES satellites. There are also more channels: 5 channels on legacy GOES satellites compared to 16 on GOES-16. There are two mesoscale sectors, each with one minute scans, or one meso sector with 30 second scans. There is a detailed list, or level of priority, for determining mesoscale sector locations. Moderate and high risks will have a high priority, followed by volcanic eruptions, and then enhanced risks. SPC will have to request a meso sector and NWS offices will have to make requests likely through NWS regional offices. There are more channels, including 3 water vapor channels for low, mid and upper levels. The sensitivity of wavelengths are greater: can see gravity waves, contrails better, etc. Geostationary Lightning Mapper (GLM) will output total lightning. Total lightning is a proxy for storm intensity. It is believed that lightning, including intra-cloud lightning, increases ahead of storm intensification. This can be applied during severe weather, when it has been found that large changes in total lightning correlate with severe weather events far more than CG trends. Total lightning can also help with DSS activities. 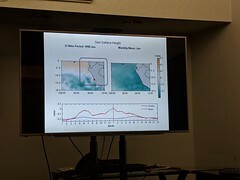 Other GOES-16 applications include seeing fires better, better views of tropical cyclones including the potential to anticipate intensification better, improved aviation forecasting with better view of stratus and fog development, and also providing additional data for assimilation into forecast models. In November 2017, GOES-16 is expected to be fully operational (is in non-op status now) and will be given an east or west assignment position. In March 2018, GOES-S will launch, 2019 is when GOES-T should launch, 2024 is when GOES-U launches and 2030s is when GOES-V series comes out. The decision of where GOES-16 will go(east or west) should be made in May. 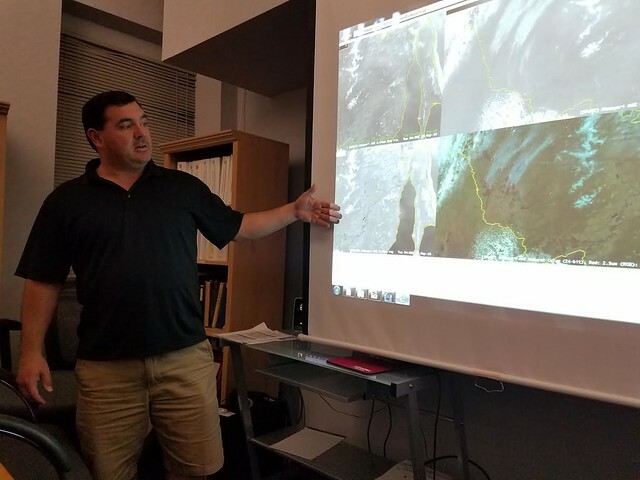 Chad showed a few examples of different things you can see with the new satellite technology. The meeting concluded at 8:30pm, and it was adjourned. Minutes were submitted by Joanne Culin, Recording Secretary. Chad Entremont presenting on GOES-16 and the future of satellite. For more pictures from this meeting, click here.